It isn't like I checked my calendar or anything like that. I do remember that It was the second half of April that they hatched. I remember that it was after the 15th because I remember thinking there wasn't any way I could sneak them in as dependents. Doesn't work that way anyway. Just joking! There were eight of them and they showed some of the genetic diversity of the flock. They probably also show that ducks aren't all that careful where they lay their eggs. Two of them are mostly black. Two of them are going to be a very light tan. The remaining four are spread in between. Without being too exact, this story is an attempt to show how fast they grow. It's a bit hard to get a good picture inside the cage. Still you can use your eyes more than your imagination to see growth here. We put Mama in the cage with her babies and leave her till she starts going stir crazy. She gets replaced with a heat lamp but almost has to last for a week if the temp is down at all. The record for going stir crazy early was the mama who sat on 24 eggs. They all hatched. This particular cage is my favorite nursery. It's seen chicken, geese, guineas, and ducks. I think the turkeys were before I had this built. They like the light but it makes them photo as a little yellow blob. The growth has really taken off here. 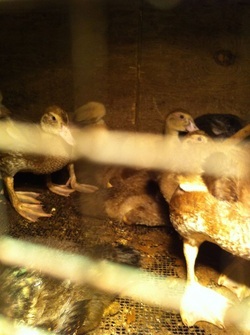 They are starting to look like young ducks instead of bundles of fluff. It's labeled 5-8. That was the date. They still had mama during this time. We left her longer than usual and I think it has made these ducks considerably tamer than many. Just a gang of eight gawky teenagers. Their feet are way too big for their bodies but I think they are going to grow into them. Mama has left the building. I know this picture is terrible but I had to include it. The babies had started emptying the water dispenser in less than four hours. I filled this one to see what they would do. They all congregated on the other end of the cage and stared at it. Finally this guy approached it timidly and realized he could take a sip. That broke the ice. Swim call. Everybody in, the waters fine. 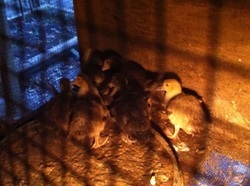 Today (26 May) we put them in the pen. They can't fly out yet but possibly can find a hole. This is something that is new for us. They will get an early interaction with other species and hopefully more interaction with us than they would in a cage. Probably the biggest bonus is indoctrination to the larger flock. Less sheltered lives. Species here are (R to L) dog, human kid, goat kids, 8 ducks. The guineas are in the enclosure at the back with the open door. Assimilation at it's best with the guineas added. By the way, the triangle on the face of the building is for pigeons should they choose to land. 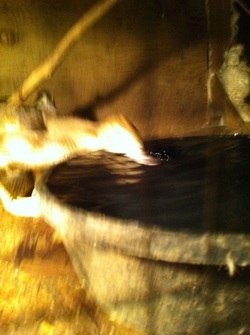 I went out tonight to give the goats some dry food and found one of the ducks had wiggled out. Will look for the hole in the morning. Tonight Bob will roam again. He has shown that he might lick the goats but shows no interest in eating them. There is nothing cuter than a baby duck. There is also nothing I can think of that grows faster. Take pictures if you want to continue to enjoy them.